Veterans and surviving spouses may qualify for financial assistance for home care and health-related benefits, yet, most veterans, families, and home care agencies are unaware of the details or of what questions to ask. ClearCare assembled an expert panel to share the inside tips of the Veteran Aid and Attendance Pension Benefit and how to make this a competitive advantage for your agency. Derek: Good morning or good afternoon, everybody. This is Derek Jones with ClearCare. Depending on where you're at today, good afternoon or good morning. We are here in San Francisco, so we're just getting the day started. I'm really excited to bring to you a really hot topic that's going to help agencies grow, bringing the Veteran Aid & Attendance Pension Benefit home. And also how the ClearCare Tag Management solution can help with this process. First, just a few housekeeping items and agenda. We're going to introduce our two expert panelists. These are two top experts, the best in the industry, to cover the topic of the Aid and Attendance Pension Benefit. Debbie and Patti will then do an overview of the program. And we want to make sure that the webinar is very practical. We want to give you the questions to ask your clients and give you confidence to go out and recommend and speak about this program. So we're going to equip you with those tools by reviewing some of the requirements, the service, income and asset test. Then we want to prepare you to show you how to use the benefits to grow your agency. We'll then quickly show, we have a lot of current ClearCare customers on the call today and agency owners who may not be using any software. We want to quickly show how we've integrated this across the Aid and Attendance Pension Benefit into the Tag Management solution with ClearCare, and then we'll have plenty of time for question and answers. For question and answers, all lines are currently muted. So in order to ask a question, everyone has the GoToMeeting panel, the control panel in your upper right-hand corner. You should be able to see the screen here, but the control panel is in your upper right-hand corner and there is an orange or red arrow. If you click that arrow, the control panel expands and you can type any one of your questions throughout the webinar and then we will address those, group those questions together and answer those at the end of the webinar. We know you're very busy. Hopefully, you can attend the entire webinar because we have just fantastic information throughout and tools that we'll be providing you. But we know that you might be juggling phone calls and scheduling caregivers at the same time. So if you happen to miss just a couple minutes and then you pick the phone back up to listen to the webinar, know that the webinar is being recorded and we will make the webinar recordings available within 24 hours after the webinar. And we also take about 10 to 15 minutes of Q&A at the end of the call. Before we get into the agenda, we want to make sure you know that we've custom-tailored the agenda based on what you've asked us to cover today. So we had just about 200 registrants across the country register for the webinar and we ask just to get an understanding of what's the baseline understanding of the Veteran Aid & Attendance Pension Benefit? We asked on a scale of 1 to 5, "How knowledgeable do you feel on the benefit?" And no surprise, almost 50% of folks said, "Very low." If we take that across the board, it looks like there's a lot of opportunity to just cover the basics and that's what we'll be covering today. But also, a few advanced tips to have this benefit help grow your agency. We then asked, "What are your learning objectives?" And this is key because any great presentation, we want to make sure it's designed around when you leave this call, hitting and meeting your learning objectives. So a few of the verbatims from the registration, Steve in Utah said he'd like to be able to clearly explain the benefits to veterans. Cynthia in Arizona said, "I'd like to be able to speak to current clients about the benefits." So whether it's on an intake or a follow-up home visit, you want to be able to speak about that benefit. Andy in Washington, I think he used a buzzword which I think is appropriate. Wants to "uncover the mystery", right? We want to make sure when you leave this call, the benefit is not a mystery and you feel very comfortable about what it is and how to apply this to your business. And then Connie in West Virginia, a current ClearCare customer asked, "How can ClearCare assist?" So in addition to bringing you the content and the presenters to this webinar, we will show you how the ClearCare platform has integrated and can help streamline management and insight and really give you X-ray vision into how to manage this benefit within your business. To get us there and to reach the learning objectives, I've been in the senior care business for a few years and it did not take long to run into the topic of the Veteran Aid & Attendance Pension Benefit. If you soon start getting a lot of questions about this, there are so many providers in this area who are knowledgeable on the topic, but have different objectives and different business models. After a long search a few years ago, we had identified two incredible speakers who not only can help you grow your business, but are also extreme advocates for veterans and they'll go into a little bit of their background. But I want to first introduce to you the founder of Elder Resource Benefits Consulting, Patty Servaes. Patty, welcome to the webinar. Patty: Thanks for having me, Derek. Derek: And Patty will go into a little bit more of her background when she is presenting. Patty and Debbie have also been friends for many years, and I have to tell a quick story about Debbie. I know a few years back on Veterans Day, I had called Debbie just the day before Veterans Day. We had some information about this benefit and I think it was like 8 o'clock at night and I wasn't really sure if I would get an e-mail response. It was too late, because we had a lot of veterans asking about the benefit. And Debbie not only replied to the e-mail to answer the questions, but she also gave me her cell phone number and we chatted for about an hour, and she was just so helpful. And Debbie is the founder of VeteranAid.org, which is a nonprofit that is the preeminent advocacy arm for the Aid & Attendance Pension Benefit. And I'd like to welcome Debbie to the webinar. Debbie: Well, good morning, Derek and thank you. And good morning and good afternoon to everybody on the call. Derek: Excellent. I think Debbie, to prime people up before we go into the details of the actual Aid & Attendance Benefit, can you share your a little bit about your story, how you came to be the founder? And then we'll talk a little bit about what your organization does to advocate for the benefit. Debbie: Sure, I'm happy to do that. I'm basically just a daughter of a World War II veteran and had parents who were aging and starting to have needs. And we were talking behind their back about, "Gosh, maybe it's time to do this or do that with our concerns of a family." And then unfortunately, fate stepped in and my parents had a house fire and they lost everything in a matter of minutes. My mom was stranded in the back of the townhouse with a patio that had an 8-foot cement wall with no exit door. And at the last minute, two individuals appeared out of nowhere; one straddled, one jumped in and they literally pushed, pulled, drug and hoisted her up over the wall. And she'd been burnt pretty severely on her back, but survived this. But after coming out of the hospital, my folks were homeless. They had nowhere to go. And we had to make a huge shift in finding a place for them and realizing the expenses attached to that and the shortfall that we were looking at to have to cover. And for a period of seven years when both my parents were together, we had made several inquiries to the VA for any kind of assistance. My dad was diabetic, single amputee. My mom had renal failure. There were a lot of additional expenses each month and we were repeatedly told that because my dad was not injured during his time of service, that he was entitled to nothing outside of a VA loan or the GI bill, which he took advantage of both. And so the family had to cover the shortfall every month. And when my dad passed away, I looked to moving my mom from Miami, Florida to Richmond, Virginia and that's when I started doing some digging around and came on this pension that was not written in English to understand, but I was so desperate, made application and lo and behold, the shock of all shocks, we get a letter stating she'd been awarded. And at that point, I realized my parents had missed out on over $140,000 during the time they both were alive and I looked back at the limit of choices we had in getting them their dignity and proper care and services and lessening the burden on us as a family covering that financial shortfall. So it ultimately left my mom in Florida and moved her upstate near my sister. And we were waiting for the award to come through and at that time, the VA declared her incompetent and didn't release the funds. She took ill and ended up in the hospital. And from the hospital, rather than a nursing home, they said we needed to put her in hospice care. And from that point, I was trying to reach out to the VA on a daily basis to get that $6,000 to bury my mom. She had begged us not to cremate, given the experience with the fire, and we knew it wouldn't be anything fancy or spectacular, but we could honor that wish. Well, that's when I kind of got an insight to how things worked with this pension and all of the challenges that it can and often does present. And my mom ended up passing without receiving that benefit and within a matter of days, I got a letter from the VA saying, "Dear next of kin, case closed." That basically started my mission to launch something in the effort to change the ending for other families, because I knew that I had information that could make that kind of difference in the care and services that could be provided, never imagining that my work would take off and evolve into what it has. That I would become a nonprofit. That I would go to Washington and speak out on this pension to congressmen, senators, work with the Senate Committee on Aging on a yearlong investigation and become an advocate, so that this pension becomes as common knowledge as Social Security, Medicare, Medicaid, etc. And it's been nine years now and it's been quite the journey from just being the daughter who found "no" to be an unacceptable answer when it should have been a "yes". Derek: And Debbie, that experience, I think, will resonate with every owner, coordinator and marketer on the call today. Anyone in the home care business has run into scenarios with clients and you've done something about it. You started a nonprofit nine years ago, Veteran Aid, which you have a few things to help folks with, starting with the website. Debbie: We do have the number one nationally-ranked website that basically walks everybody through not only educating about the pension, who's eligible? How do you apply? Where do you mail that application? What are the necessary documentations that have to support that application? And I go through my personal experience in making this application and not accepting a "no" and we provide resources. And then we have the supporting forums with over 4,500 registered members. Where that community supports one another and shares their experience, whether it be a success or an obstacle and asking for assistance to get around it. So that little effort has transcended itself into literally having changed the lives. And I humbly this of hundreds of thousands of individuals who would have otherwise done without. Derek: Fantastic. And I know as a personal supporter and friend of Debbie's for a long time and a donator, I think there's a great . . . that Debbie is really making a lot of noise out there today about the benefit, has been published. She's very humble. She's been published in The Times and a lot of major publications and is continuing the advocacy. And as you out there today, as you think about your clients, you can check out the website, the forums. As you consider your annual giving, your contributions will help Debbie to continue getting that message out. And you know Debbie, when you and I first met when I had asked you the question, you know we give this question for clients who always want . . . they want a reputable resource and you had recommended Patty in Elder Resource Benefit Consulting. And before we have Patty come on and share all of her knowledge about this benefit, you're a nonprofit and you have the choice to work with any partners in this space. Why did you choose and continue to choose to work with Patty in Elder Resource Benefit Consulting? Debbie: That's a really easy question to answer. I'm very picky and I've got nine years of a reputation on the line here of not being aligned with anybody or manipulated or benefiting, personally, financially from my efforts as I have self-funded this project from the beginning of it. And because of the work that I do and the e-mails that I receive every day in the forums, I know the horror stories out there of these financial planners and the arrangements of people that claim to be a VA-accredited special agent that knows this pension, guarantees you 100%. I know where the fraudulent activities are taking place, I know those partnerships. And as I stated earlier, I worked with the Senate Committee on Aging on a yearlong investigation, trying to expose these folks that have used this benefit as a calling card, if you will, wearing their patriotic pin and all of their fliers making it look like they just really love our veterans and are here to support in any way they can. And quite frankly, most of them arguing anything but that. It's all about putting money in their own pocket. Patty and I came together through the forums, ironically. Where she started answering questions and then I reached out to her and then one thing led to another in our conversations. I learned that Patty's background, her history, her integrity, her morals, her dedication, that she was doing this for the right reason. I saw her go the extra mile. And the first time that I had an opportunity when Senator Tom Coburn referenced my website on the floor at a speech in Congress, I reached out to Patty and said, "I want to go to D.C. Might you consider going with me?" And from that point, Patty and I have gone back several times and scheduled as many as eight and ten appointments in any given day, walked ourselves through all of the Senate buildings that are a little overwhelming, if you don't know where you're going. We got on a senator's elevator we weren't supposed to be on and the whole thing just turned into a journey. I have watched her fight for medals for our veterans that they didn't even know they were entitled to. I've seen her do things at no cost because the situation was that dire and desperate. She has consistently stepped up as somebody with integrity, dedication, devotion and have never questioned her motivations for this. And she is the only person - and when I said "only," all caps, underscore. Only person I would ever refer to and trust, that she is not going to exceed the spirit of the law on this. She is not going to do this for the reasons that these fraudulent folks do, and that anybody that she can help, she will. She'll do it legally, morally and ethically. Debbie: I take my hat off to her. I have the highest respect for Patty and her work. Derek: Thank you, Debbie and thank you for sharing your story. I think you know that's important before we get into the real nuts and bolts of what this pension is and how to help it grow your benefits, to benefit your agency and also to lay the found work of why we've chosen Patty to be on the call and why she is the expert and the go-to person in the industry. So Debbie, thank you again for sharing your story and for your nine years of advocacy. And we'd now like to welcome Patty to the call. Patty: Oh, thank you very much. And as I've said before, I definitely have to pass away before Debbie because clearly, she needs to do my eulogy. Before going into this, I do want to say that for those of you that have been in this industry for a long time, if you were in it in 2005 or earlier, you probably haven't heard of the VA's Basic Pension with Aid and Attendance. It's been around since 1953 and only one thing has changed. And that is, they really upset the wrong daughter. If it wasn't for Debbie, this benefit to this day would still not be as well known as it is. Because when I owned a home care agency back in 2005; that's right when it very first started to be a known benefit, and it was her forums and her advocacy that has really brought this into the light of day for everybody. All right, now we can get into some guts of the situation. First of all, I want to be very clear about how ERBC, the company that I founded and Servaes Consulting Group make their money. That nobody's wondering about that for the rest of the call. Elder Resource Benefits Consulting runs a website and assisted livings advertise on that website - one flat fee per year. And then we assist their residents at no charge, providing free pre-application analysis. 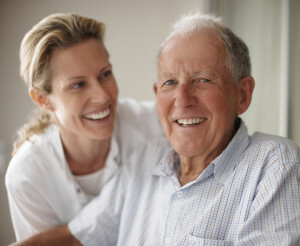 Then we also have home care agencies that work with us. Under the home care agency model, it is not an advertising model because the clients come and go too quickly for that to be effective. And having been a home care agency owner, that was very clear to me, how we needed to make it work for home care agencies. So what happens in the home care agency model is people can hire us private pay. It starts with a pro bono cash flow analysis where we explain to them the VA benefit as it fits their situation. And they leave that phone call knowing, "Hey, my income and assets and situation is right for the VA benefit." Or they leave knowing, "Hey, this is when I'm going to qualify for the VA benefit." And they don't ever have to call us back and that phone call was free. If they do decide to move forward with us, Servaes Consulting Group employs VA-accredited individuals and they would move forward with us by purchasing our one-time cost of $800 cash flow analysis. And then we provide pro bono support for them for the life of the applicant. Meaning we hold their hand from nuts to bolts, from the minute that they start working with us, until the veteran has passed away. And if there are accrued benefits, we assist them until the accrued benefit filing is complete. The other way that we make money is we do appeals. So if you have any clients out there who've applied for a VA benefit and were denied, you can recommend that they send us a copy of their denial letter and any correspondence and responses that they had to the VA. Schedule a free phone call with us, we'll go through all the data, tell them if we think we can overturn it successfully. If we cannot, we'll then tell them that this is when you're going to be in a success situation with the VA. When we do appeals, it's generally 20% of the back award on anything that we can recoup. So 20% of everything that they're not getting anyway, but no percentage of anything going forward. We also do not sell or refer financial products or trusts. We don't have any relationship. But we refer to a certain attorney or to a certain company in order to sell the veteran or surviving spouse any money. Our philosophy is "This is not a yes or no award, it's if and when". But every veteran and surviving spouse needs to have an understanding of what the "ifs" and "whens" are in their retirement toolbox, so that they get this benefit as soon as they're eligible for it. 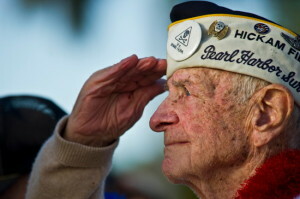 We also believe that veterans and surviving spouses should have the money they need to age in place. Relieving the veteran and the surviving spouse of their oh so burdensome cash is not the business that we are in. I'm ready for the next slide. Derek: I'll mention this because when we did our full transparency, when we did the slide review, this slide was not originally on. But Patty wanted to make sure because of the integrity of her business and just to preface the presentation that she was fully transparent about what they do, and I think there were some interesting points. That they just charge a one-time flat fee, which is very different than almost any person that home care agencies will meet and that pro bono lifetime support is just a really unique factor of her business. Derek: All right, Patty, let's get into the nuts and bolts. What is the Aid and Attendance Pension Benefit? Patty: That's right. So like I said before, this benefit has been around since 1953 and it's tax-free and it is to assist wartime veterans and their surviving spouses who require the assistance of another person with aspects of daily living and who meet certain financial criteria. I know I have a good audience for the terms "Aspects of daily living." As you know and most seniors don't know, "daily living" does not mean that they have to need the assistance every single day. Back in November of 2012 when they did the census report, there were over 9 million veterans who were over the age of 65. That figure does not include the surviving spouses. So you can pretty much you know, double that figure because the veterans, usually the men, pass away first, leaving their wives and then some of these veterans are married. The VAs, they'll tell you to expect 12 to 18 months turnaround time with this application. The midpoint of that is none months, but the VA definitely tells you . . . I guess it's not the midpoint. I don't know why "nine months" is still on this slide. Our average time to award is four months. And like I said, the VA tells you to expect 12 to 18 months. How we maintain that high average is when we are helping someone with the application, we review it and audit it with the eye to what questions could the VA possibly ask on this application and trying to make sure they're answered before it gets to the VA so that the VA has nothing to do but grant the award. The maximum award for 2014 is $1,130 a month for a surviving spouse, $1,758 for a veteran, $2,085 for a married veteran and a well veteran with an ill spouse if the veteran's fine, but his wife is the one who needs home care, can receive up to $1,380 per month. This award does go up with Social Security. So the rates should be going up - I think it's about 1.6%. As soon as Social Security absolutely finalizes it, it will have those final numbers. There's usually some rounding discrepancies in there. So one of the questions that people asked was, "What can the benefit be spent on?" Okay, that is a very interesting question. The benefit is distributed to the veteran or surviving spouse just like your Social Security check is. It gets paid directly to the veteran or surviving spouse. An so for all intents and purposes for them, it's cash. And they can spend it on anything they want. Why that is so important for home care people to understand, is that VA funds are non-attachable by anyone except the U.S. government. What does that mean? What that means is if you say to a veteran, "Okay, we're going to tell the VA that you're paying me $1,200 a month, but you only have to pay me $500 a month until your VA money comes in and then you can pay me the difference." When they get their award letter, it always comes with a little disclaimer sheet. And the last thing mentioned on that disclaimer sheet is, "These funds are non-attachable by anybody but the U.S. government." So if anybody has told you that you owe them this money, that's not true. And so you can be in a situation where, let's say that took ten months and you were floating them $800. You can be in the situation where the veteran says, "Hey, I don't think I have to pay you that $8,000, because this letter right here says that I don't have to pay you," and they would be right. So our philosophy is you don't want to say that somebody is paying something to you that they're not and put it on a form and certify to the U.S. government that they're paying you that. And you don't want to put yourself at risk for sending in false documents to the U.S. government or for leaving yourself open with that big bad debt. And what we found and what I found when I owned a home care agency, was that what works with the VA is the truth. You know, if the person's just spending $100 with you on home care and that's just going to get them a benefit of $100 or $200, that's okay. And then once that benefit comes in, if they want to start spending more money with you, they can. And when this slide says it can be spent on home care, assisted living, home health, other out of pocket medical expenses, it can also be spent on cigarettes. It can be spent on groceries. It does not have to be spent on any specific thing. 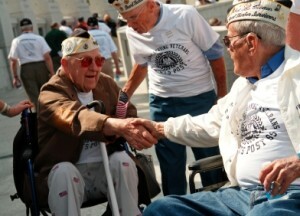 The deal with the VA benefit is in order to get the benefit, they must spend part of their income on medical expenses. And hopefully, that'll become really clear when we go through the income slide. Ready for the next slide. Derek: Excellent, thank you, Patty. And what we've provided here is we know what Patty just covered is a very important piece. Who qualifies, what the amounts are, and who to contact, right? So what we've done at ClearCare is if you go back to the registration page, ClearCareOnline.com/Veterans-Webinar, you can actually download a nicely-designed sheet that you can actually hand to your clients. You can put this in your marketing folder. You can have it in your intake folder when you have a client sign a service agreement. We want to make sure that you have a nice piece that you can hand to a client which will give the high-level overview of what the eligibility requirements are and what they will need when they contact Patty. So that's a free resource for you. Now, how did these agencies get this benefit? We're going to show an eligibility stair step here and Patty is going to cover this. But to make it simple, we provided a visual. There are four main steps. There's a service and a veteran test that starts first, and if the clients meet that criteria, they move onto the medical, then the income and then the asset test. Now, as Patty mentioned, the average turnaround time after all four of these requirements have been met is 12 to 18 months, for the VA. But why we brought Patty here and what she does best is she, on average, turns around the benefit in four months. So as you, as an agency owner, if we listen to the tips and the tricks and we follow some of the best practices that Patty will provide, this is beginning your clients' quicker access to cash, it means they can afford services. Maybe they prevent going to an assisted living facility which then, just from a revenue perspective, that is a client that is unable to stay in the home, per their wishes, and also is not billable by you. Now, you'll hear us talk a lot and we'll keep going back to a statement "Just call". Because well, Patty is going to go into some details of each one of these steps. We do not intend or really expect anyone to become an expert on this topic. We'll often mention you know, "Just call" and we'll give you the questions to ask. But do sit back, Patty will go into some of the granular details of each step, starting with the veteran and the service test. Patty: Okay, so this is a benefit and it's for veterans who served at least one day during a period of war. They have to have served at least 90 days in total and have been other than dishonorably discharged. And it really is as simple as that. When I'm giving speeches, I often hear, "Oh, I was told that my dad doesn't qualify because he didn't serve overseas." It's not an overseas benefit. "Oh, I was told my dad didn't qualify because he didn't see combat." It's not a combat benefit. It's, "Did you serve at least one day during a period of war?" It doesn't matter if you were stationed in Knoxville, Tennessee with the U.S. Coast Guard and never set foot on a boat. As long as it was at least one day during a period of war, at least 90 days in total and you were other than dishonorably discharged. Now, a couple of things on this slide I want to point out to you, starting with World War II. Lots of folks think World War II ended on December 31, 1945. It did not. It ended on December 31, 1946, for purposes of this benefit, because the VA includes the year of peacekeeping. I've given speeches before and had people in the audience who were there for a relative, an older relative amazed because they found out they were actually considered a World War II veteran during my speech, because they went into service in '46. I'm sure you'll run into clients in that same situation. So you want to make sure, you know, if they're like, "Oh, no, I went in after the war." Say, "You know what? The periods of war are not the same as you may think they are. They're prescribed by Congress for purpose of the benefit." Same with the Korean War. The Korean War, I think that a lot of the folks who served during that period think that it started a little later than it did. The Vietnam War, it's the only one that for a little bit of time, has a requirement to have been in Vietnam. It's the first little asterisk there. From February 28 of 1961 through August 4 of 1964. Because we were pretending like we weren't at war with Vietnam, you have to have served in the country or off the waters of Vietnam for this benefit. That's one of the things that Debbie and I have lobbied Congress and the Senate on to get them to change. Because they just honored the 50-year mark of when the Vietnam War started and they honored February 28, 1961. We were at war then and it's something that should be changed. But right now, you have to be able to prove that you were in the country of Vietnam during that period. If you were in not in service at any time after August 5 of 1964. And then with August 2 of 1990 with the first Persian Gulf War, they changed it that you have to have a minimum two years active service. We have been at war since August 2 of 1990. So anybody who has served after August 2, 1990 through today is eligible for this benefit. Okay, who's a surviving spouse? Now, the reason that we have that stair step design is because if you can't pass any one of these steps, you can't move forward. So to be the surviving spouse of a veteran, you have to have been married to someone who met those veteran criteria. You have to have been married to him at the time of his death. If you weren't married to him at the time of his death because you got divorced, then you are what's considered an ex-wife, not a surviving spouse and you are not eligible for this benefit. The other criteria are that you have to have been married to the veteran for at least one year prior to his death. The reason they had to implement that is that in the early '60s, we had a lot of nurses in nursing homes marrying the dying World War I veterans to get their benefits. And the VA had to say "Oh, no, we don't think so. You have to have lived with him for at least one year prior to his death." And then the third requirement is that you cannot have remarried. Now, that requirement did not go into existence until November 1 of 1990 and it can be very tricky if somebody has multiple marriages. And we would never want you guys to be in the position of telling them "no" and having it incorrect. So please, if you have somebody who's like, "Well, I don't know. My husband died, but then I remarried and then that guy died." You know, just have them give us a call. It's easy, they can schedule the call online. We'll very nicely tell them what the situation is. And that way, you know that they get the right advice. Okay, so if you're a veteran or surviving spouse, you get to move to the medical criteria. Okay, so the medical criteria, this is kind of interesting and this leads to a lot of the confusion that's out there. The words "aid" and "attendance" are actually a medical rating in the VA system, okay? So if anybody's ever been told, "Oh, you can't get aid and attendance because you weren't injured in service," as Debbie's father was told, that's because you're talking to somebody who has experience with the compensation benefit. That is a benefit for folks who were injured in service. Pension is a benefit for somebody and you do not have to have been injured in service. But guess what? In the compensation benefit, there's a little bit of extra money if you're 100% disabled and because of your 100% wartime disability, you need, oh, no, the aid and attendance of another person. So if you're working with a veteran services officer who's dedicated his life to helping soldiers who were injured in service get benefits, he knows that when he's got somebody who was really severely injured in service and he's 100% disabled, he can get him an extra $700. And he knows if you're not 100%, you can't get it. You get zero. But he's not educated in the pension benefit, which unfortunately, also has the name "Aid and attendance". Because "Aid and attendance" is a medical rating in the VA system that means you need the aid and attendance of another person, okay? And that's something funny that we have to talk about with families all the time. "Aid and attendance of another person? Well, she uses a walker." Like, oh, a walker's not a person. But is your daughter doing a standby assist with a shower? Do you have home care coming in, doing the grocery shopping, helping with cleaning? Those are people. So it can be very confusing when you're talking to somebody who is an expert in one portion of VA benefits and not another. But for you guys, breaking it down, focus on home care, there are two levels where we can get paid out. The first is the home-bound level. That means somebody can't leave their home, can't drive, can't leave their home without a companion. Then we're in the ballpark and we can start talking about, "Are you getting any help from another person?" Aid and attendance? That's that next level up. You know, is somebody doing a standby assist with the shower? Does somebody have to help you with mobility? You know, does anybody have to actively administer your medication? That's when we're really at the level of needing the aid and attendance of another person. If you have somebody with dementia and they're unsafe at home alone and so one of your caregivers is there for a couple of hours providing cuing and redirection, we're at the aid and attendance level. The VA regulation is that you need the aid and attendance of another person with activities of daily living. It is a much looser definition than some of your state definitions are. I like to say, "The VA lets you tell the story." They want to hear, "Well, gosh, what's the reason why the person needs the help?" So whenever we have somebody who's marginal on aid and attendance, we tell the story. I'm making it clear to the VA why it's unsafe for this person to not have the home care. Okay, now we're going to get into the complicated part, the math part of it. The financial criteria for the VA is a two-pronged financial test. The first test is the income test and it's the driver. So that's where we're going to spend most of our time. If I were to ask you guys - if you guys were not muted and able to talk and I were to ask you, "What's income?" People would say Social Security, pensions, interest and dividends, oil well royalties, farm income, income that you get from a rental house. And I would say, "Yes, that is all income." And if I were giving a live speech, I would say, "So, do we all agree what income is?" and everybody would say, "Yes," and then I'd say, "Well, guess what? That is not income for VA purposes." And that is the most important thing that you're going to take away from today's meeting. Income for VA purposes is everything that we just agreed was income, minus regularly occurring, unreimbursed medical . . . oh, my gosh, what is that? "Regularly occurring, unreimbursed medical expenses." That is the VA's way of using the most syllables to possible to tell you that it has to be something that you pay on a regular basis that insurance or your daughter, that nobody is going to reimburse you for. But you can only deduct those things if you qualify for aid and attendance, because remember our stair step? "Okay, you're a veteran. Okay, you meet the medical criteria. Oh, okay, since you met this medical criteria, we are going to let you deduct your home care costs, your medical insurance premiums." It depends if you have them to not be deducted, even though you buy them on a regular basis. Prescriptions? No, not on a regular basis. Because the VA says, "Hey, you could change prescriptions. You could start buying your stipends at a cheaper place." So they exclude some of the things that a rational person would think of as a regularly occurring, unreimbursed medical expense. But home care, and your medical insurance premium, any out of pocket that you have to pay for kidney expenses, if you're on dialysis, things like that do count. Go to the next slide. Next slide, Derek? Thank you. Okay, so let's do a little example. Let's say that you have $3,000 income every month and you pay $4,000 in your home care costs. You're negative $1,000. If you are zero or negative in your income for VA purposes, it has an acronym, IVAP. I didn't make that up. Then that's an indication that you're looking at the full monthly benefit. The reason I say that this is the most important thing that you're going to take away from the call today, is that I gave this speech in 2006. I think it was the second time I ever gave this speech. And the very next day, a gentleman called me up and he said, "Hey, Servaes. I want to know what type of game you're playing. Because I was at your speech yesterday and I called the VA and they said that my dad was never going to qualify for VA benefits because he had too much income." And I said, "Well, what did you say to the VA?" And he said "Funny enough, exactly your example." That's the situation he's been in. I said, "Well, what did you say to the VA?" He goes, "They asked me how much he had in income and I said '$3,000 a month, $36,000 a year,'" and then I didn't say anything. So he tapped his phone and he said, "Hello, are you still there?" And I said "Yes, I'm waiting for the part where you told the VA that he pays $4,000 a month in home care costs, so his income is actually negative $1,000 a month, negative $12,000 a year." And he said, "I didn't say that. I got to go," and he hung up on me. Okay. So that's why it's the most important thing you're going to take away, because if anybody from the VA asks, "What's your income?" it's a math question. It's a math test and it's up to you to remember, "Oh, I've got to minus out all those unreimbursed medical expenses," because the VA is not going to do it for you, okay? Now, that's a full benefit. And what a lot of people do is they just push themselves. And when I say "push themselves", I mean, you know, they push themselves over the boundaries of the law to get somebody the full benefit. Well, the fact of the matter is, the VA will give you a partial benefit. So in our example, if the home care cost is $2,000, then they would be left with $1,000 in VA income and they could subtract that from the pension they're going for and see what the VA would give them. What I mean by that is if this is a surviving spouse, they would say, "Oh, the maximum pension you can get is $1,130. Let's minus $1,000 and we'll give you a benefit of $130 a month." That's pretty good. Some people might say, "Jeez, $130? That's not much." But I think it's pretty good. Now, once they get that $130, if they want to buy more home care with that, then we take the next step and we say, "Hey, VA. Now, I'm paying another $130 a month for home care costs." And they increase the benefit. What happens a lot at that point, and was my experience when I owned a home care agency is that instead of just increasing at the $130, now they know this is real. Now they know that this is something that they truly can get and they increase their monthly amount to what they need and we let the VA know. And then at that point, their VA benefit goes up to the amount that they should be receiving in total. Now, if somebody is in a partial award situation and we'll just stick with that surviving spouse who got $130 and she's got $1,000 a month that she left on the table. Like the VA is giving her $1,130 a month. But the $1,000 a month, that's just sitting for her over at the VA. Well, what they can do is there's items that I told you the VA doesn't consider "regularly occurring", prescription costs stipends, your eyeglasses, hearing aids, things like that. They can submit those expenses to the VA as unreimbursed medical expenses and the VA will reimburse them dollar for dollar until they've eaten up the whole $12,000 that they left on the table. So not getting the full award is not the end of the world that some people would lead you to believe. Now, using our example, to show you the power of getting this money. If our applicant had $25,000 in assets and $1,000 in additional monthly expenses - because of course, everybody has to pay for food and electricity, etc. - they would be out of assets in one year, 12.5 months. But if they got the benefit, right, for a surviving spouse, we now have more than $13,000 a year coming in, that would extend the amount of time before her $25,000 was gone to 2.3 years. For a veteran with an ill spouse, if they were getting the full $1,380 a month, that would extend their $25,000 to last 3.3 years. So from one year to 3.3 years, not bad. A single veteran makes it last 8.61 years. And if it was a married veteran, it puts them into a positive cash flow situation and they're not dipping into their $25,000 nest egg. So a very meaningful benefit. It's a lot of money, for most people. Okay, so we've met the veteran, the medical, the income criteria. Now we got to go to the asset criteria. Okay. The asset limit is determined by each individual situation. They look at age. They look at your illness. They look at your income for VA purposes test and they decide how much you can have in assets. Now, anytime you have more than $80,000 in assets, the VA can use judgment to decide that you have enough assets. If you have less than $80,000, they cannot use judgment to decide if you have too much in assets. And we have been successful getting the benefit for anybody who has $80,000 or less, as long as they've passed the income test. So if you run into anybody who says, "Oh, the rules have changed. Now you can only have $30,000 or $40,000 or $60,000," that person either doesn't know what they're talking about or they have some hidden agenda and are looking to relieve your client of their oh-so-burdensome cash. Because we can get it for anybody who has less than 80. Now, when people have more than 80, sometimes we can make it work. Sometimes we have to say, "You know what? You have $186,000? We think that you can have $130,000, and based on your cash flow analysis, it looks like you might meet that number, say in August of 2015 or something like that." We have clients who call us back and check in with us every single year and you know they don't want to move money, they don't want to get on a program before they're supposed to, they don't want government money before they're supposed to get it. And they call us back, three years later, four years later, and get on the program then. And that's why I say it's important to have the “if” and “when” in your retirement toolbox, so that you get this money the minute you're supposed to get it. Now, the largest amount of assets we've ever had somebody have in their own name and get the benefit was $248,000. It's a rarity, you know? She had a lot of income, actually. She had a lot of income, but she had a lot of medical expenses. One of my clients with the largest amount of money was somebody who had a live-in caregiver and also went to adult day three days a week. So they had significant home care costs. The number that we see most frequently as, "Hey, we think that this might work," is when it's between $120,000 and $150,000. And anything, of course, under, but I'm saying my calculation comes out saying, "Hey, I think that anything less than 125, 130, 140," those are the most common answers that popped up for me. And so I know if I know that, that the VA knows that and that Congress knows that. Oh look, see it's so important, I already told it to you. Just remember, it's not a yes or a no award. It's if and when. So here's some common myths. There is no hard and fast $80,000 asset limit. When a veteran or spouse is in the nursing home on Medicaid, the non-Medicaid spouse, the person living at home can still get the full benefit. I discovered that when I owned a home care agency. I cannot tell you how many times I would run into somebody who now needed home care, whose husband was in a nursing home and they had been told by the nursing home not to apply because they'd only get $90. That only applies to unmarried veterans. If you are married, the spouse can still get up to $2,085 a month if she needs home care. And you know, I owned a home care agency, so the very first lady I ever helped out with, I can still remember driving her over to her husband's nursing home to visit him and hanging out with her in her house having tea. So a veteran living at home whose wife is receiving home care can still get $1,380, meaning the husband's fine. You know, maybe he's out golfing while your staff is there taking care of his wife. He can still qualify. People often think, "Oh, it has to be the veteran who needs care in a married couple." That's not true. Another common myth, if denied, that you have to wait a year to try to reapply. That's not true. That's not true at all. And a lot of folks race out and do an appeal when they get a denial letter. That is the longest way to go in the last avenue of resort that you would want to take, because the average time for an appeal to be settled is over 600 days. And so if we get an appeal or denial, the first thing we do is read through it and say, "Is there any way that we can do what's called a 'reconsideration' by providing additional support or evidence to the VA?" So there's some common myths that you now know the answers to and I'm finished. So there you go. Derek: Thank you. Thank you, Patty. The simple stair step method is a nice visual. They must continue up that ladder. But we also went into some complicated questions on marriage and divorce and there's a lot of questions that the attendees are asking about that. And there's questions on income and what qualifies. What we collectively - and Patty having owned a home care agency, we understand that you can't be experts whether you're a marketer, coordinator or owner on this benefit, and that's why we brought Patty to you to explain this and that's why her company exists. The one question that we want to make sure that you ask to pre-qualify your client to give Patty a call is, "Is your mom, dad or loved one a wartime veteran or a surviving spouse of a wartime veteran?" If the answer is "yes", you can call or schedule an online appointment with Patty's team. Now, the way that you call and get the phone number and that link is through the download on the webinar registration page. Many of you have downloaded that already. But there is a phone number and you can actually book the appointment directly online, so you don't have to play phone tag. You can actually directly book an appointment and you can see the schedulers' time frame to make sure that you get that. But well, we just covered the five steps, those are very complicated. We don't expect home care agency owners to walk through those steps with each of their clients. If you can ask one question to your current list of clients, "Is your mom, dad or loved one a wartime veteran or surviving spouse of a wartime veteran?" If the answer is "yes", then we're encouraging you to take that next step, and if they can take that next step and they can presumably find more dollars for service for you. Now, because there is a lot of steps in the process, we did have a question from Connie on how ClearCare can assist. And ClearCare has a Tag Management System that assists with a lot of customization of how agencies run their office, but particularly, Aid and Attendance Pension Benefit. So we want to quickly show for those who are customers or those who are in the home care business, how you can follow that stair step method using what Patty just shared with us. 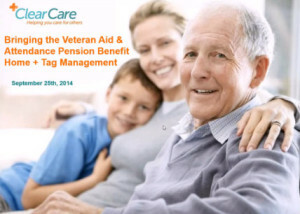 So in the ClearCare system, Tag Management is the ability to add a custom tag onto any client, including those who are going through the Aid and Attendance Pension Benefit. So those of you who use ClearCare today, you're familiar with the interface. And if we go in, we can actually click in to the client. Because if you have 100 clients today, we want you to start asking that question, "Are you a veteran or a surviving spouse?" And if you have 100 clients, presumably, there's multiple coordinators in your office and we need to get organized around this so we can have a game plan. So what we have here are a list of clients listed on the dashboard. And what I'm going to do is I'm going to into George Strait here. George Strait actually is a veteran, he was in the Army and actually, his first band was while he was stationed in Hawaii. So what we want to do is since George Strait is on our roster, I can actually add the profile tag that he is a veteran and that he had applied for the Aid and Attendance Pension Benefit. And then I just click Save. So we have all of his information. Now we tag because I just made a phone call. I want to make sure that I'm maximizing this benefit and the hours for all of my clients. Same thing with a surviving spouse. So if I go back into our list of clients, I'm going to go click into Meryl Streep. She's a surviving spouse of a veteran and I can add that tag onto her profile, as well. So if I say a veteran spouse that she is and that she has applied for the Aid and Attendance Pension Benefit. What I'm also going to say is because she used Patty's services, once Patty notifies the home care agency, we can say, "yes", that she was actually awarded that benefit. Now, the way that we show that benefit, the tag management is because, again, if you have 50 clients, 20 or 100, you need a game plan. You need to be able to see which clients are veterans to know which ones actually may qualify, so you can give them the right information. So the second step that we can do is we go into our reports and we can actually pull our clients. Like we can say, "Let's get a list of all of our clients." And what I'll say here is, "Let me get all of our clients who are not listed as a veteran, or not listed as a surviving spouse of a veteran." And when I run this report, if I'm a coordinator or a manager at the office, what this does is this enables . . . this is my list where today, I start going down this list and I start calling clients to ask, "Hey, did you know about this benefit? All I need to know is if you are a veteran or a surviving spouse of a veteran, we can start this process." So those are two simple steps of tagging and then pulling a report to get organized for current customers, or those are using agency software today where you can get organized, get a game plan and start making sure that your clients, if they do qualify, we can start passing them off over to Patty's firm and the business impact is to be able to increase hours and ultimately improve the outcomes of those clients. Okay. So we will turn it over for closing comments here. Ask the one question. That one question is, "Are you a veteran during a wartime or a surviving spouse of a veteran?" That's the only question you need to know, even though Patty went through the five steps. If the answer is "yes", then they can take that next step where's Patty's team can do the free pre-qualification. Keep it simple and easy. Patty went through examples and a lot of gray area on spouse, divorce, when were we married, wartime, certain dates. We don't expect agencies to be experts in that, that's what they are for. Continue to support the awareness of this benefit through VeteranAid.org. Debbie told her story and it's one that is very powerful. And as she continues her mission to get the information out and advocate for that benefit, anything we can do to support her will benefit all of us. Use and download the quick reference guide, which is available on the webinar registration page. And for those who are using ClearCare or who are home care agency owners or coordinators today, that using the tag management benefit of ClearCare is a way to get organized around the Aid and Attendance Pension Benefit. So with that, we have a lot of questions and we're going to take just a moment to compile all those. And we will start asking questions to Patty and Debbie. Give us just a moment to compile the questions. All right, so we have time for just a few questions here. Housekeeping items is, "Will the PowerPoint and recording be available?" Absolutely, we will have the recording available within 24-hours and sent out. That way, you can have all the information. We have a lot of questions around the topic of divorce when we were at that particular situation. Patty, the one question that continues to come up is, "What are the general rules regarding divorce?" Hey, Patty, you might have yourself on mute. Patty: I did have myself on mute. Patty: Okay, I'll tell you, but I'm telling you, do not tell somebody "no", because the rules are complicated. Basically, if you were divorced from the veteran at the time of his death, you are not that veteran's surviving spouse and you cannot get the benefit. However, if you were married to a veteran and he died while you were married to him, remember that's the only way to get off the step. You were married to a veteran and he died. That's the only way to become a surviving spouse, and you remarried and you were lucky enough that that guy you remarried who was not a veteran died before November 1, 1990 or you divorced him before November 1, 1990, you can go back to your first husband's service. But if you were married to him at any time after November 1, 1990, right? So your first husband died in the '70s, you married somebody else in the '80s and you divorced them on October 31, 1990 and you just needed to have started the proceedings, it doesn't have to be final, then you can get the benefit. If you didn't start divorcing him until November 2, you're out of luck. Your only hope is to marry a veteran. Derek: Patty, we have another question from Tyson. Tyson asks, "Is it possible to know how much the veteran or spouse will receive before they submit the application?" Patty: Yes, that's the income test. So you take their income from all sources and you minus out the regularly occurring, unreimbursed medical expenses. So in our example, when we had the 3,000 minus the 4,000, if you have zero left in income for VA purposes or negative, right? So 3,000 minus 4,000 is negative 1,000, you're looking at the full benefit, okay? So you would know, "Hey, you're negative. You're going to get the full amount." Of course, we would tell them that. But if you're positive, right? So a surviving spouse, the maximum she can get is $1,130. If she is positive $1,000 after we minus out her home care costs, then we would look at the pension of 1,130, we'd minus $1,000 and she would get around $130. Derek: Excellent, all right. And we know we're a few minutes over, but we have a few questions. So if you want to stick on, we'll do our best to answer all the questions. There's a two-part question from Elaine. Elaine's first part is, "If you have received a letter saying that the veteran has been approved, but then no check follows for over a month, how do you get the VA to pay up?" Patty: Well, if you have a letter that says that the benefits are paid as of September 1, okay, you have to be aware that the VA pays everything one month in arrears. So if it says September 1, you're not really supposed to get a payment until the first week of October. Why do they word it like that? Who knows? But it causes a lot of confusion. So the first thing you want to do is wait until the first week of the month after the VA says they're going to start paying you. So September 1? You've got to wait and give them at least until October 5. Then the other reason that benefits are likely not being deposited is because you have changed bank accounts and closed the bank account where the money was supposed to be deposited. So when that happened, instead of writing you a letter saying, "Golly day, your bank account isn't working," they just sit there on the money waiting for you to know the . . . I don't know what. That you need to get in touch with them and update your direct deposit. So, you know, if somebody were in the situation that I just described - because I'm a VA-accredited agent, I would call after if they didn't get by October 5. I would probably call, like on October 6 or 7 and say, "Hey, what's going on? We thought that was going to get deposited." And at that time, the VA would tell me, "Well, we sent her a check." And I would say, "Well, what address did you send it to?" Or they would say, "Ooh, we did direct deposit, but that bank account doesn't work anymore," and we would address it that way. Derek: Great, thanks, Patty. Again, to type in questions, you can type those in the GoToWebinar chat panel. We have a question from, let's see . . .
Patty: I thought Elaine's was a two-part question? Derek: It did and we'll cover it in another question here from Stacy. "As a home care agency, do you have to have any certifications or special licensing to receive the money from the clients?" Patty: No, the client receives cash. You are not getting the VA benefit itself. So it would be like saying, "Hey, do I have to have a special license to get Social Security or to get that pension?" No, they get cash and they spend it how they want to. Derek: Excellent, okay. And Faith had a very similar question, so Faith, hopefully that addresses that. We'll take just two more questions here. Leslie asks, "For assets, I was told it excluded car and house, is that true?" Patty: It is. Sorry, I usually say that. So countable assets are everything except one home, one car and your personal possessions. Now, people get in a lot of trouble because they think, "Oh, my home doesn't count," and then they sell it. And what do they get for that? They get cash. And what counts? Cash. So your home does not count unless you sell it or rent it. If you sell it, well, now you have some cash and that counts. If you rent it, it's an investment property and investment properties count. So it's very important that you know, like all of our clients know, "Hey, you've got the benefit. But if you sell that house, you need to be back in touch with us, so we can handle it appropriately with the VA."
Derek: Excellent. We'll take the last question here. This is from Richard. Richard asks, "Can they, " I think this saying husband and wife, "both get home day care programs, ten hours a week, and aid and attendance at the same time?" Patty: Well, you know I'm not quite sure what he's talking about. Because if he's talking about home-based care from the VA, because the veteran was service-connected, what would generally happen is we would move the award from a service-connected award to a pension award. No other benefits are impacted by that. So if that's what he's asking, if someone's getting a service-connected home care and maybe they're service-connected that 30%. So they're receiving you know less than $500 can they switch to pension and still keep their home care? The answer is "yes". If it's some other type of home care program, I just don't have enough information to speak to that. Derek: Got it. Okay, great. There are a few more questions. What we'll do is we'll save those and send those to our panelists to help address after the webinar. Thank you so much to all those who were able to attend today. We know you're very, very busy. Thank you for all you're doing for clients, your communities, and all the caregivers that you're putting to work. And again, our sincere thanks to Debbie Burak from Veteran Aid and Patty Servaes for taking your time and all the advocacy you're doing for seniors and veterans out there today. This will now conclude the webinar. Have a great week.